Appropriate for all levels, this class can be used as an introduction to yoga, or postures can be adapted to meet the needs of individual students in each class. Stretching, breathing, balance and coordination are the focus. 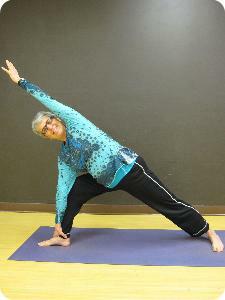 Bev Holstun, the instructor, has been practicing yoga for 25 years and teaching for 11 years. In addition to a 200 hour certification recognized by the Yoga Alliance, Bev is certified to teach prenatal yoga and restorative yoga. This class is currently held on Mondays from 5:45 PM to 7:00 PM at the CPC. Pingback: The old Cascade People’s Center: Meet the new Cascade People’s Center - Yay Today!